March is a strange time of year in Minnesota. Mostly, it's just plain soggy. So on a day off in March, a proposition like this might be interesting: "Wanna come to Shamrocks's and watch some guys take the Nookie Challenge?" Yes, I did. So I pulled on my boots, grabbed my bag, and headed to Casper & Runyon’s Shamrocks in St Paul. Shamrocks is the sister restaurant to The Nook in St. Paul. The Nook is widely recognized for its Juicy Lucys, served two ways. Their Juicy Nookie burger is a burger stuffed with runny American cheese. Their Paul Moliter Burger is a burger stuffed with pepper cheese. They serve up hand-cut fries with their burgers, and they source their buns from P.J. Murphy’s on Randolph Ave. Shamrocks offers a similar menu to that of The Nook, and definitely carries the famous cheese-stuffed burgers. Soon, the challengers arrived. They were seated at their reserved table, and presented with the challenge. The challenge was simple enough in theory: it required that one eat two Nookie Supreme burgers with fries. One Nookie Supreme is two 1/3 cheeseburgers and special sauce on a bun with a heap of fries on the side. So the challenge was to eat 2 of these giant double cheeseburgers and two orders of fries. Yep, that's about a pound and a third of beef with all the fixings and fries. 4 men attempted the challenge. Two conquered it. All 4 of the men consumed both of their giant cheeseburgers, but only 2 of the 4 consumed all of their fries along with their burgers. According to the challengers, the fries became cold and unappetizing as the burgers were consumed. All agreed it was a lot of food, and the two that completed the challenge were definitely feeling the pains of overeating. The prize? 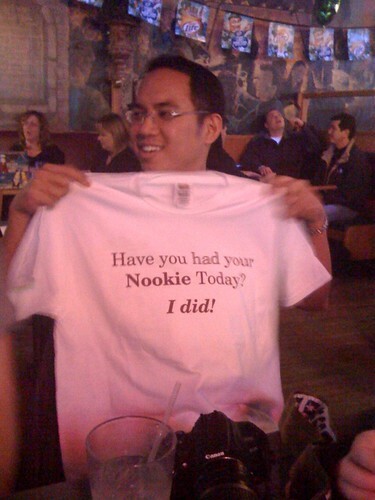 A T-shirt that reads, "Have you had your Nookie Today? I did!" and, of course, bragging rights. Eat giant burgers; get a shirt! PS - I forgot to take my camera, but I managed to capture a couple of shots with my phone. Mea Culpa. Doni - my first juicy Lucy was the Paul Moliter! My husband turned me on to the craze. He's been a Matt's junkie for years. His choice of the man has been full of the greed and negative elements. The choice of the lady and essay writing services review been don for the humans. It has been marginal for the movement of the quite good and vital parts for the humans in life.